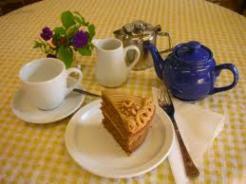 Holland's Nurseries Tea Room / Coffee Shop Opening Soon. Holland's Nurseries again put on a huge display of plants for the 10th consecutive year of supporting the show. 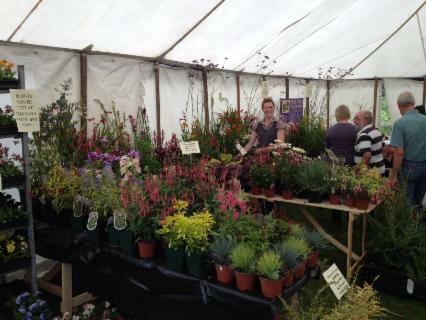 Within the Horticultural Marquee, the stall opens following the church service at 10.00am. Click here to visit the official Sutton Bonnington Show website. 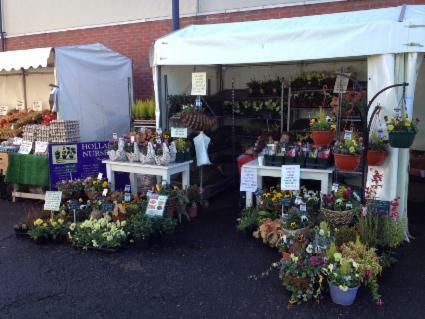 Holland's Nurseries held a plant stall at the Melton Mowbray Food Festival on Saturday, October 06, and Sunday, October 07, 2012. At the stall we had pansies, primroses with assorted mixed Autumn/Winter baskets, heathers, bulbs and pre=planted containers. Click here to visit the Melton Mowbray Food Festival Website. John is learning how to create his first website. Susan is busy making hanging baskets. Phil is looking after customers and carrying their plants out to their cars for them. Karen is watering. Karen loves watering. Fiona is potting, endlessly potting. Alicia is making mud pies and riding her bike around the nursery. Ethan is making mud pies and driving his car around the nursery. That concludes the main news for Holland's Nurseries today.